According to The New Shorter Oxford English Dictionary a thug is a member of a religious organization of professional robbers and assassins in India, and the word dates from the early 19th century. The cult began in about 700 and sacrificed people to the goddess Kali, wife of the god Shiva. Kali encouraged her followers to kill unbelievers and, with each murder, the follower’s standing would be increased. Kali would eat the human sacrifices until one day a follower saw her. She gave forth a tooth, a rib and a length of her sari, which became respectively a knife to dismember victims, a pickaxe to pluck out their eyes and a noose to strangle them. In southern India her followers were known as Phansigars (from the Hindustani phansi meaning “noose”) and in northern India as Thugs (from the Sanskrti othag, meaning “to hide”). 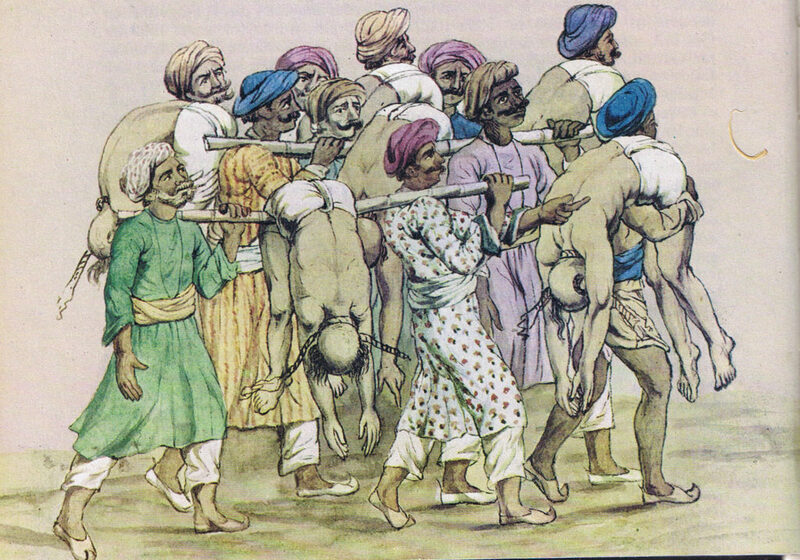 Both Muslims and Hindus joined the Thuggee cult. Thugs usually kidnapped boys aged about ten to initiate them into the cult. Before each murder a group of thugs would pray before the statue of Kali. All the attacks took place in the winter and there was a strict protocol to be followed. They would only rob if the victim had been murdered in the approved fashion and they never killed women, boys under ten or anyone who was disabled. The most infamous member of the Thuggee cult was Behram Jemadar, born about 1765 in India. He was said to have been the world’s most prolific serial killer, dispatching 931 people between 1790 and 1840. He would sneak up behind them and strangle them with his rumal or ceremonial cloth. However, more recent research shows that far from offing nearly 1,000 people, he was actually only personally responsible for a quarter of that number. He did admit to being present when 931 people were murdered by the Thuggee cult but “I may have strangled with my own hands about 125 men, and I may have seen strangled 150 more.” It is thought a gang of between 25 and 50 thugs were responsible for the mass murders. The British Army in India began a crackdown on the cult and by the 1850s the Thugs had been all but suppressed. Behram was hanged in 1840.